Licorice has been used since ancient times for both its appealing flavor and its medicinal properties. Its sweet root can lower inflammation, regulate cholesterol, and much more. Licorice has been a popular herb since ancient times. Its genus name, Glycyrrihza, comes from the ancient Greek words glycys, meaning sweet, and rhiza, meaning root. It was also known to be popular with the ancient Egyptians, both as a flavoring agent and as a remedy. In the past, it was used for dozens of purposes, from curing hunger and thirst to clearing chronic coughs. Today, it is the subject of research to find out what its true health benefits are. Treating upper respiratory infections. One of licorice's most important active components has been shown to be effective in reducing the length and intensity of colds and coughs. Soothing skin ailments. Conditions like eczema have been shown to benefit from application of licorice. Relieving heartburn. In some studies, licorice has improved symptoms of indigestion and acid reflux. Inducing weight loss. Licorice may reduce body fat, but further research needs to be done. Relieving symptoms of menopause. Licorice's isoflavones are estrogenic and may help ameliorate hot flashes, but more studies are required to investigate this possibility. The component in licorice that provides it with its sugary sweet taste, glycyrrhizin, has also been shown to inhibit virus growth. Research indicates that glycyrrhizin can be used to shorten duration of colds and other respiratory infections and reduce the intensity of the symptoms. Glycyrrhizin is also an anti-inflammatory and has been shown to improve the symptoms associated with eczema when applied topically. Although the exact mechanism of action is not known, licorice has been shown to help produce a thick protective mucus in the stomach lining that improves symptoms of stomachic ailments. Licorice's flavonoids have been shown to be effective against bacteria that may cause stomach ulcers. Herbs popularly used for treating respiratory conditions, like cough and colds, are lemon, eucalyptus, and onion, while jojoba and neem also have antimicrobial properties that can help treat skin conditions, such as acne and eczema. When consumed in foods, licorice appears to be safe. Medicinal amounts are mostly safe as well, although licorice can cause serious side effects, especially if taken in too high a dose or for an extended period of time. Small doses of licorice have the potential to cause muscle pain or numbness, whereas larger doses can cause headaches, fatigue, high blood pressure, water retention, and possibly heart attack. Licorice interacts with a number of medications, including ACE inhibitors, diuretics, digoxin, corticosteroids, insulin, laxatives, MAO inhibitors, oral contraceptives, blood thinners, and medications processed by the liver. It can also be dangerous to take for those who have one of several preexisting conditions. Licorice should not be taken as a medicinal herb for those suffering from heart disease, liver disease, kidney disease, diabetes, hormone-sensitive cancers, high blood pressure, low potassium, fluid retention, or erectile dysfunction. Pregnant and breastfeeding women should also avoid licorice, as it is thought that taking licorice during pregnancy may increase risk of stillbirth. Anybody planning on using licorice as an herbal remedy should consult with a doctor. Licorice is well known for its use as a flavoring agent in candies, but it is also available in a number of medicinal preparations. Licorice is a popular plant for its particular flavor, which is used in pastries, candies, and other sweet products. Tea. Licorice root tea can be used to treat colds and relieve stomach problems. It can be bought, or it can be made at home by steeping dried licorice root in boiling water. Powder. Powder may be added to either cold or hot water as a remedy for acid reflux. Extract. Licorice extract is often applied externally to treat eczema and other similar skin ailments. Tincture. Half a teaspoon of tincture made from licorice can be added to a half cup of water (100 mL) and taken twice a day for respiratory infections and gastric upset. Capsules. Licorice capsules are an easy way to treat viruses and reduce symptoms of stomach issues. Raw licorice is easy to find in most herbal shops around the world. 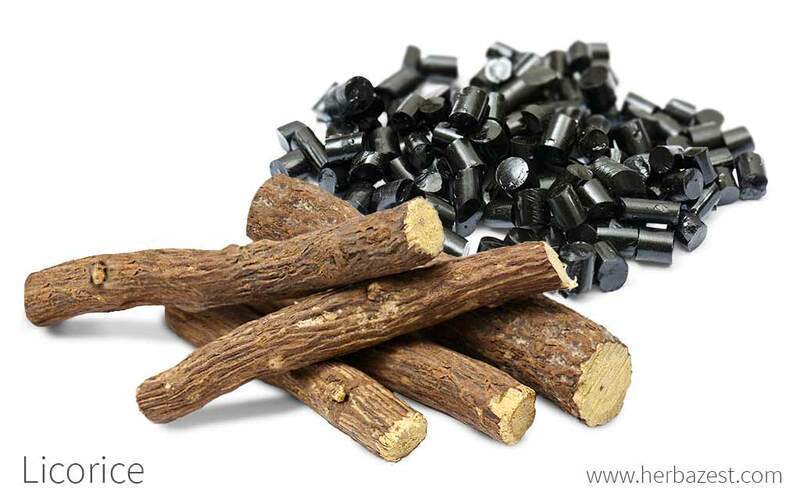 The most common presentations of raw licorice include the whole root branch, typically dried. Powdered licorice is not as common but may still be found in specialized stores or ethnic markets. Licorice supplements are mainly found in specialized health stores and online retailers. Each brand of licorice supplement may come with different concentrations, and they are available in capsule, tablet, and liquid extract form. Licorice plants are a long investment, taking several years to mature after being sown, but they will eventually produce a healthy and delicious crop. With a little care, licorice can be grown in any garden or backyard in a warm or temperate location. Licorice plants can be propagated by either seed or cuttings. If using seeds, they first need to be scarified (the seed's surface must be scratched for water to enter easily) and soaked before planting. Rich, moist, sandy or loamy soil is the ideal type of soil for licorice to grow, and there must be enough depth for the roots to grow. The plant should be placed in an area with partial shade to full sun. Although licorice can be grown in soil with a pH ranging from 5.5 to 8.2, the ideal pH level is 7.3 - 7.8. Frequent moisture is required to grow a healthy licorice plant, so irrigation may be necessary. Licorice grows best in warm climates, but does well in temperate climates as well. It can survive winters of 5°F (-15°C), but does not produce well in cold regions. The best growth occurs between 37 - 82°F (3 - 28°C). Generally, licorice plants will need two to three years before reaching maturity and becoming ready for harvest. Licorice is susceptible to a few diseases, mostly fungal diseases that can be avoided with the appropriate fungicides. Licorice is a perennial herb that is native to the Mediterranean coast, although it thrives in a wide range of climates. It has a woody stem and can grow to a height of six feet (2 m). Licorice leaves are a dark green, while the leaves range from a pale purple to blue. The plant does produce seeds that appear in oblong pods. Licorice may also be called liquorice - the UK spelling - or sweet root. Licorice, or Glycyrrhiza glabra, is a member of the Fabaceae or bean family, which encompasses about 17,000 species across 700 genera, including economically important crops such as alfalfa (Medicago sativa), beans (Phaseolus vulgaris), fenugreek (Trigonella foenum-graecum), soy (Glycine max), and tamarind (Tamarindus Indica). G. glabra is divided into two major subspecies, G. glabra var. glabra and G. glabra var. glandulifera. The latter is sometimes referred to as G. glandulifera, though it is now considered a subspecies of G. glabra rather than its own species. Licorice has a long and varied history. It was discovered in the tomb of Pharaoh Tutankhamen, and researchers believe it was used in ancient Egypt for its healing properties. Licorice root is also thought to have been used in other areas of the ancient world such as China, Rome, Greece, and Babylon. Licorice became such a popular ingredient for candy in the 1300s that Edward I levied a tax on the plant, and used the money to repair the London Bridge. By the same time, licorice was also on high demand among European women, who used it to lighten their hair. The licorice industry is of moderate economic importance. It is estimated that up to 60% of licorice produced finds its way into the tobacco industry, where it is used to provide flavoring for cigarettes and other tobacco products. It is also frequently used to produce sweets and confectionery. Many countries throughout the world cultivate licorice, including Spain, England, China, Kazakhstan, Azerbaijan, Iraq, and Turkey. Many people do not know that not all licorice candy is made with flavoring from the licorice plant. Although the candy takes its name from this herb, many types of licorice candy are in fact flavored with anise oil, not licorice. Licorice has also been the subject of historical rumor. Reportedly, the reason that Napoleon Bonaparte had black teeth was because of his habit of chewing licorice sticks. Flavoring. The most common use for licorice is as a flavoring agent for tobacco. Surprisingly, more licorice is used to flavor tobacco than is used to flavor food or candy. It can be used in cigarettes, snuff, chewing tobacco, and pipe tobacco. Personal care. Licorice is also popular in shampoos and skin care products. Dental care. Licorice has become a popular choice of toothpaste ingredient after a study suggested that it helps prevent tooth decay - although it should not be used as a replacement for toothpaste. Licorice must be used with caution, but with a doctor's supervision, it can be a very useful and potent herbal remedy for those suffering from stomach ailments, itchy skin, or frequent colds. Germplasm Resources Information, Taxon: Glycyrrhiza glabra L.